Serving as both decorative and storage baskets, these woven sturdy paper rope baskets have a stylish vintage look to keep toys, towels, toiletries, magazines, and more organized and out of view. Featuring a handcrafted weave over a metal wire frame for support, these handy shelf baskets have a natural look yet will maintain their shape over time. Ideal for tidying up small items on open shelving, these convenient baskets are the easiest way to keep the home tidy while keeping items within reach. SPECS: Large - 4.7 H × 16.7 W × 12.8 L; Small - 4 H × 15 W × 11 L (in inches). DECORATIVE ORGANIZATION: Stylish containers perfect for storing clothing, magazines, books, toys & various odds 'n' ends throughout your home. INNER METAL FRAME: Hidden metal wire frame provides support to help basket maintain a neat shape. 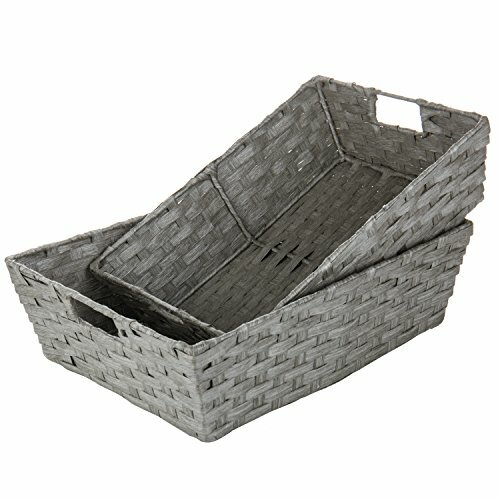 NESTING DESIGN: When not in use, small basket can be stored compactly in large basket.